Welcomed by a front porch, enter the Lapis plan to see a study or flex room off of the entry. Continue ahead to the back of the home where you will find an open layout that is great for entertaining. The kitchen has a center island which faces the dining area and great room, as well as a large walk-in pantry. The large extended patio off the kitchen is a perfect extension of the entertaining space inside. Upstairs, find four bedrooms including the master suite, along with a convenient laundry room. The master suite has a private bath and a large walk-in closet. 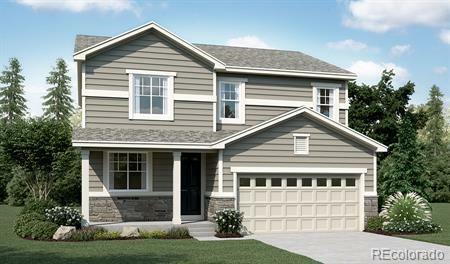 There is still time to select interior finishes at the Richmond American Home Gallery. Cornerstone is conveniently located on the northeast corner of Colorado Blvd and Thornton Parkway with quick access to I-25. The new lightrail N Line will be walkable from this community!